Organic Nail Bar Naples, FL: Read A Customer's Account Of Our Herbal Pedicure! Are you looking to pamper yourself? 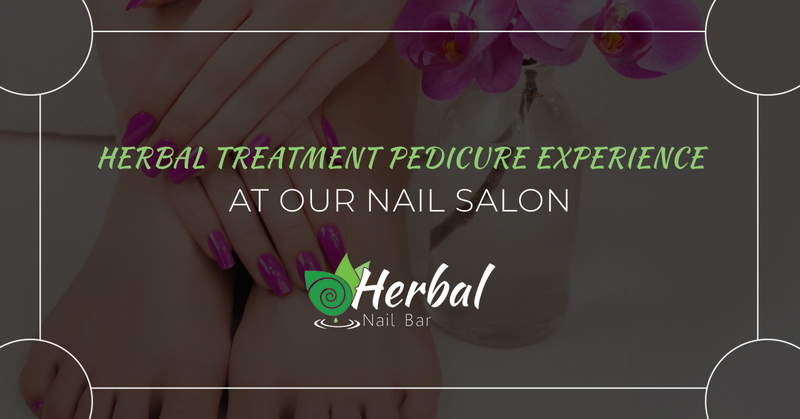 Try the Herbal Treatment Pedicure at Herbal Nail Bar. I tried the Detox Blend (consists of lemongrass, rosemary and green tea). I may never go back to a normal pedicure. The whole experience is beyond relaxing. From watching the nail experts create the blends for my pedicure at their “herbal lab” at the organic nail bar to smelling the quality ingredients in the water and while being exfoliated. All of the ingredients are fresh and organic, nothing was from a bottle. Clean, new tools for each pedicure. Disposable tools for the cleanest experience every single time. The aroma is so strong that when clients walk through the door they have complimented the great smells of the herbal pedicure. I have broken down different parts of the Herbal Treatment experience below that I received at my favorite nail salon near me! Soak – with Detox Blend, Dead sea salt, himalayan salt and aloe gel which reduces stress. Exfoliation – all organic, all fresh, nothing out of the bottle for this natural pedicure. Herbal smells fill the room and it soothes your mind, body and soul. Truly unique experience. Exfoliation is very relaxing. They create the unique blends right in front of you in their own “herbal lab”. The base of the exfoliation scrub includes aloe gel (healer of the dessert), himalayan salt and dead sea salt. Quality ingredients and application. Soothing French Clay – soothing experience which returns moisture to skin. While the mask is hardening they move on to the cleaning of the nails. Pedi – Remove nail color, shape and file nail, cuticles are removed. Lemons are used to remove excess cuticles! Cuticles are removed and they pay extreme attention to this. I was surprised at how much cuticles I have on my toe nails. Great cuticle removal and inspection. The best cuticle removal experience I’ve had at any Naples nail salon! Lemon applied to my nails after to the cuticles. Lemon benefits: softens cuticles, sanitizes cuticles and slows down the growth of cuticle. This is a great natural remedy and I loved experiencing this at the organic nail salon! Mud mask has dried and it pulls the toxins out of your skin. They rinse the mask off and massage your legs which leaves your legs feeling refreshed. Hot Towel – One towel for each leg! Extremely soothing experience and the most relaxing part of the pedicure. Ready to book your own Herbal Pedicure? Schedule a service online! Try A Natural Pedicure for Yourself At This Organic Nail Bar! Everyone should experience a Herbal Treatment Pedicure, it is very invigorating. The whole experience was comfortable and luxurious, even the chair had the latest massage technology which was the cherry on top of the sundae for me. You can create any Herbal Combination to best relax you. They have an extensive list of fresh, quality herbal ingredients (including lavender, rose, peppermint, chamomile, coffee, lemongrass and more). I really needed a detox and the lemongrass, rosemary and green tea combo did the trick. Next time I am looking forward to a rich chocolate and coconut pedicure. What herbal combo would you try? Check out the menu and book your Herbal Treatment Pedicure online!